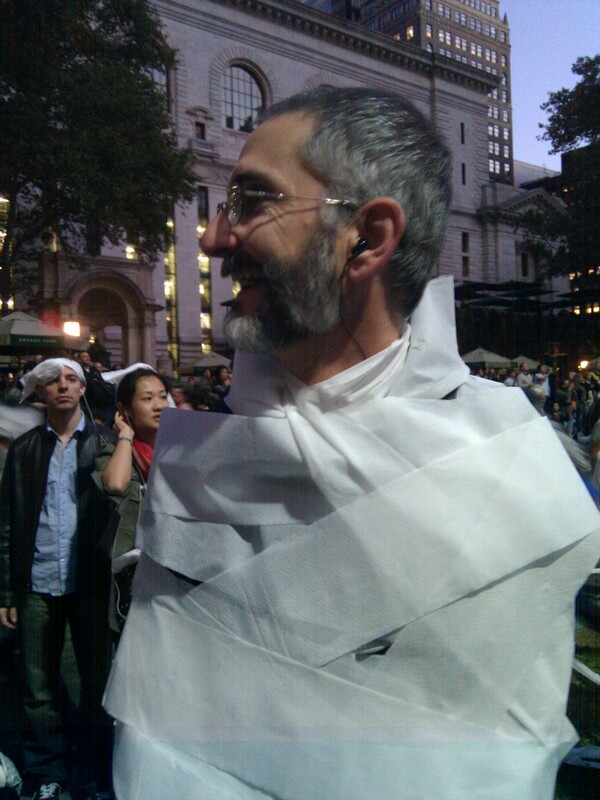 Four thousand people in Bryant Park yesterday mummified themselves in toilet paper and danced the funky chicken. The party was put together by Improv Everywhere and I read about it online yesterday morning. I wasn’t sure how many people would actually do this, but this is New York, and it turns out there were gazillions of people participating. The internet instructions said to bring a roll of toilet paper, a gift to give away, two pieces of paper and a marker. Mark and I downloaded an mpeg to our mobile phones and then positioned ourselves in a Starbucks within a predetermined eight block area. We were supposed to go to a retail outlet, but we were running out of time, and were hungry, so we ran into the Starbucks five minutes before we had to start listening to the mpeg file. At precisely 6:00pm we began listening to the pre-recorded message telling us to act casual, look around the store, scratch our heads and see if anyone else in the store was scratching theirs. Four other people connected to their headphones were simultaneously scratching their heads. The party had begun! The six of us examined merchandise, searched for products with a specific price tag, and then slow danced with our favorite product. At this point the store manager, and all the counter people, were staring at us like we were insane. The manager started telling people to put down the coffee cups. Just at that point the recording told us to calmly walk out of the store. Perfect timing. On the sidewalk we gave strangers high fives, did a quirky walk, imitated animals, and then stood completely still in the midst of pedestrian traffic. The next instruction was to go to Bryant Park. We turned the corner and the sidewalk was completely packed, both sides of the street, with a mob of people wearing headphones all converging on the park. With everyone listening to the omnipotent voice on the recording, we exchanged gifts, drew maps, held up letters to form words, sentences and poems, and then finished the evening with a tp mummy dance party. We met David, and Lisa, and Antonio, and Roger, and Corinne. David was really cute. We exchanged gifts. I gave him scented soap. He gave me a shot glass that says ‘Drink till he’s cute.’ I should have gotten his number. The likelihood we’ll ever see each other again is zero. It was a great way to finish a performance art weekend. Mark and I saw Laurie Anderson in concert Friday night in Brooklyn. I’ve had her recordings since high school and was totally jazzed to see her perform, live and in person. Then Saturday afternoon we saw a performance art ‘tour’ of Governor’s Island, recreating or sorta recreating a Dutch person from the 1600’s talking about the island. A note on historical re-enactments: Charlie and I went to a museum near downtown Little Rock with historical re-enactors and it was dreadfully dull. We bailed early on that trip and spent the afternoon relaxing with drinks in hand. Historical re-enactments have their time and place, but if they aren’t done well, they should be done in. Since the Governor’s Island event was ‘performance art’ and not ‘re-enactment’ I found it more amusing than disappointing. And I got to show Mark the art exhibits I’d help install earlier in the summer. After last night’s party in the park I’m hooked. I signed up for the next event with Improv Everywhere. I think it’s No Pants Subway Ride. And you know I have no hesitation doing that. NO PANTS on the Subway? Hey be sure to take pics! Sounds like oodles of fun. I am happy you are doing things for you! Love you Pablito! Sounds like a ton of fun! And the Dutch performance art would have been so cool, too. That is where/when our dutch forefathers (and a few mothers, too) got here. I expect they would have been shocked by the thought of one of their decedents dancing in toilet paper through the park.